A few months ago we announced the release of the investigation report on this accident, published ten years after the event, postponing our comments to the next update of this website. A careful reading of the report highlighted some aspects that seem having been neglected, especially as for recommendations are regarded. These in fact represent the proactive part of any investigation, which, as it is common knowledge, tend exclusively to ascertain the causes in order to prevent future accidents. While in this case the causes appear to be sufficiently clear, however, there is a lack of some recommendations that we have tried instead to emphasize in order to change the unfortunately still widespread opinion that sees bird strikes as an inevitable and unpredictable natural event. On the contrary, although their total elimination is impossible, they are a phenomenon that can be foreseen and contained within acceptable margins of risk. Our comments on the report can be read here. The 2017 BSCI annual report is finally available on the ENAC institutional website. The reason for the delay in publication seems to be the complex bureaucratic procedure for appointing an external wildlife consultant expert. However, the fact that the Italian Civil Aviation Authority does not have an own in-house permanent team of wildlife experts is pretty unusual. That said, in 2017 we can see with pleasure a decrease in the total number of impacts, which we hope will represent a permanent trend. However, it is always necessary to point out, as indeed BSCI also does, that statistical fluctuations may depend on various factors and it is early to shout for victory. As usual, we try to offer our contribution to the deepening of the question with some observations and comments on the report. This extraordinary photo shows the effects of a bird ingestion into a USAF C17 engine. The photo was taken during the recent Australian Air Show held in Avalon (Victoria) from 1 to 3 March. The video that appears by clicking on the link below shows an event (not rare) of a multiple bird strike with gulls. The event occurred in Barcelona on 5.5.2018. The most impressive thing is the number of birds that fall on the runway after the impact despite their attempt to avoid the collision with a giant landing at 250 km/h with the engines at idle. The disconcerting thing, however, is that there is no trace of this event even on the most documented sources on this matter. This leads to reflect on the statistics reliability and on the fact, complained also by ICAO, that 70% of the strikes are unreported. The report shows that over the ten-year reporting period, there have been 11 occurrences involving one or more birds ingested into two engines of turbofan-powered aircraft. Only one of them however regarded a four-engine aircraft. India's DGCA released their final report on the incident occurred to a GoAir A320. During the take-off run, a bird struck the right hand engine causing vibrations and abnormal sounds. The crew continued take-off, shut the left hand engine down and decided to land back. The crew subsequently recognized they had shut the wrong engine down, restarted the left hand engine and reduced the right hand engine to idle. The aircraft landed back about 20 minutes after departure. "In the absence of abnormal parameters the crew decided to continue"
Also in this quarter there was a considerable number of cases (at least five) in which the crew, after having suffered a bird strike of which presumably did not know entity and damages, consciously decided to continue the flight. Reasonably, the pilots had to take into account the risks related to the duration of the flight, the presence of alternate airports along the route, etc., but the fact that such flights in most cases ended with a landing back or a diversion, is quite perplexing. Furthermore, in some cases post-flight inspections revealed substantial damages that prevented the continuation of the flight, or worse, determined an engine replacement. The airlines do not issue precise directives for these cases and consequently very often the crews are left on their own to decide what to do. A clear position would therefore be desirable in this sense, obviously prudential and conservative, from the airlines. ANA A321, during the initial climb an engine ingested a bird but recovered; the crew continued the flight to destination. The aircraft was unable to depart for the return flight however as the spinner was found missing from the engine after arrival. 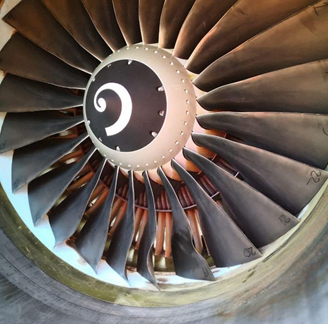 TAAG Angolan Airlines, B777, on approach an engine ingested a bird and failed. The crew managed to land normally. The aircraft was unable to depart for the return flight, however. 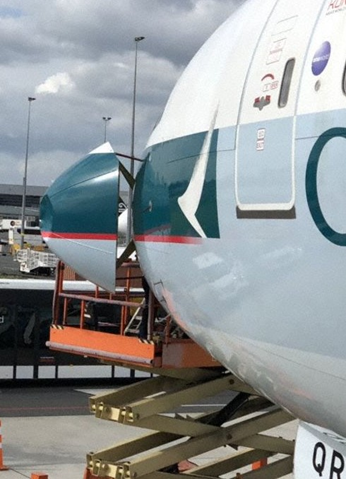 Cathay Pacific B777, during the initial climb the aircraft flew through a flock of birds and received a number of bird strikes. 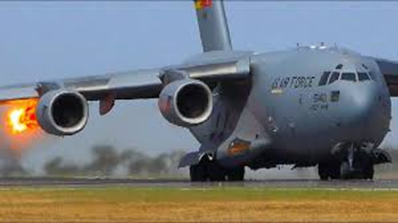 In the absence of abnormal indications, the crew continued the flight but then decided to return to Auckland bout 90’ after departure after having dumped fuel. 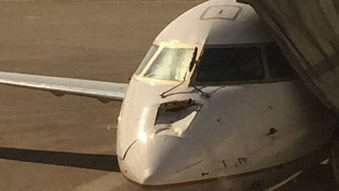 United A320, during the initial climb the aircraft flew through a flock of geese; a bird impacted the windshield of the aircraft leaving it covered with blood. The crew, also considering the weather and visibility at Spokane, decided to divert to Seattle. American Airlines A321, during the initial climb at about 400 ft. one or more birds impacted the right wing causing damage; the crew decided to land back immediately about 25’ after the departure. 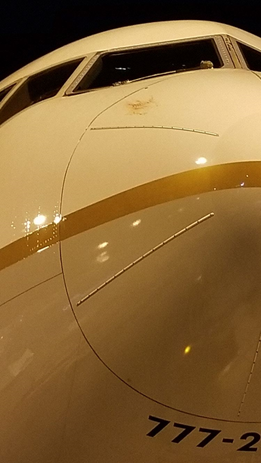 Pakistan International Airlines B777, during the initial climb a bird impacted the radome causing a dent; in the absence of abnormal indication the crew decided to continue the flight to destination (Jeddah). After having reached FL380 and being enroute about 160nm southwest of Peshawar the crew turned to divert to Karachi due to a higher fuel burn than anticipated. LATAM Chile B767, bird strike on take-off; the crew continued the climb to initial cruise level 330 in absence of abnormal indications. After levelling off indications for an engine prompted the crew to shut the engine down. The aircraft dumped fuel and landed back about 105 minutes after departure. COPA Airlines B737, during the initial climb the right engine ingested a bird causing the engine to repeatedly surge. The crew landed back about 15 minutes after departure. rejected takeoff at high speed (about 130 knots over ground) following a bird strike into one of the engines. Two flights were instructed to go around as result of the rejected take-off. The flight was cancelled. Air Canada Rouge B767, during the take-off run the crew observed a bird, felt an impact and a yaw, however, engine parameters remained normal. The crew continued take-off and then decided to continue the flight as all indications were still normal. Enroute at FL330 the crew received indications of increasing vibrations of the left hand engine and decided to return to Toronto. Maintenance decided to replace the left engine. Remains of a bird of prey were found on the runway. 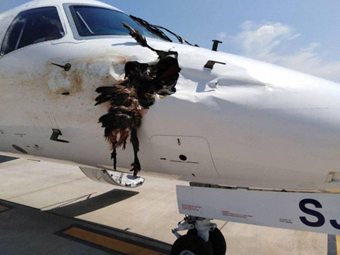 South Africa Airlink ERJ135, climbing through 7000 feet at about 240 KIAS a large bird, reportedly a vulture, impacted the aircraft's nose, penetrated the pressure vessel and became stuck. 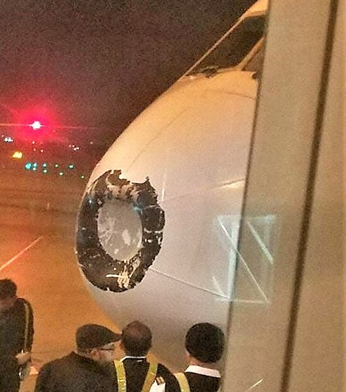 MEA A320, after the landing at Abu Dhabi a post flight inspection revealed evidence of a bird strike into an engine; the aircraft was unable to depart for the return flight on schedule. Lufthansa A321, during the take off the Tower observed smoke from the aircraft and something falling off the aircraft. A runway inspection found debris on the runway, small pieces of bird(s) possibly originally being a larger bird. The crew was informed and decided to land back about 25 minutes after departure. A postflight inspection revealed the right hand engine had ingested a number of birds. during the initial climb the left engine ingested several birds prompting the crew to land back about 25’ after departure. Delta A319, on approach hit a bird that caused minor damages to the leading edge of the right wing. Emirates B777, on approach a bird impacted the aircraft. The aircraft was unable to continue its schedule, the onward legs as well as the return legs needed to be cancelled. United A320, immediately after take-off flew through a flock of ducks and received multiple bird strikes. The crew decided to land back about 20 minutes after departure. The runway was closed for about 15 minutes for clean-up. 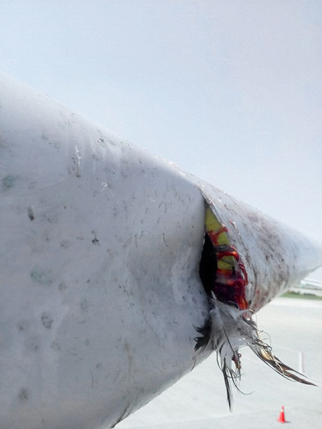 A number of ducks hat hit the left side of the fuselage and caused damage to 5 low pressure compressor blades of the left hand engine, blade tip curl and blade tips missing. The blade damage warranted an engine replacement. Jetblue ERJ190, in the initial climb the crew advised they had hit a bird and needed to return as a precaution. Southwest B737, on short final at 200 ft. the crew reported they had flown through a flock of small birds; unknown damage. PIA B777, on approach a bird impacted and penetrated the leading edge of the left hand wing; however was unable to depart for the return flight on schedule. 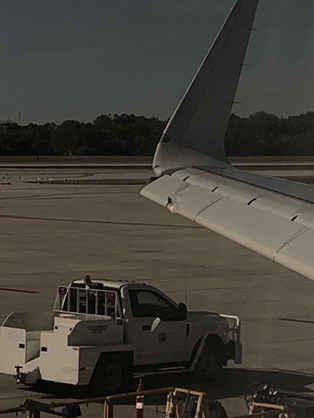 Endeavor Air CRJ 900, bird strike during the approach at about 4000 ft.
United B777, during the initial climb the crew reported they just had "a fairly large birdstrike at the nose". The crew dumped fuel and returned about 55 minutes after departure. Maintenance assessed the damage to the nose finding the damage to have remained within the limits permitted and released the aircraft to depart again. Air traffic control plays a fundamental role in accident prevention within a generally clear and detailed regulatory framework. However, some air navigation service providers have been involved in legal proceedings following birdstrike events; at least in one case the Control Tower has been sentenced by a Court to refund part of the damage following an assignment of liability. With this paper Valter Battistoni aims to provide an analysis of the ICAO regulation on this matter, not just to ascertain possible liabilities of air traffic control in birdstrike events, but rather to assess whether and how the aforementioned regulation takes into account the role of ATC in preventive actions for safety purposes. It will also seek to understand whether the ICAO regulation is applied in a uniform way in the technical manuals of different countries, or if dissimilar interpretations exist. This is also in consideration of the introduction in several airports of new remote sensing instruments, avian radars, which will also pose additional problems of management and responsibility.